The rare and valuable Maltese Turtle is presented to a crowd of adoring fans at the New York City Zoo. Later that night, two thieves, Otis and Sid (the Doltish Brothers), steal the terrapin. The following morning Raph buys the newspaper and sees the headlines about the turtlenapping. He decides that the TMNT should help a fellow terrapin in need, but the other guys aren’t interested. Thus Raphael decides to don a private dectective costume and solve the caper himself. Raph scours the world looking for clues, but comes up empty handed. Eventually a newsboy suggests that he should try looking in the phone book for the Doltish Brothers listing… oddly enough, this strategy works, and Raph heads off to the docks to the Brothers’ not-so-secret hideout. Inside the sanctum, Otis and Sid are getting the fifth degree from thier mother, who’s very unhappy with her sons’ choice of crimes. She wants them to steal better stuff! Raph busts into the shack and tricks the Brothers into standing still while the ninja grabs the Maltese Turtle. Before Raphael can complete his rescue, he’s knocked out cold by Ma Doltish. Meanwhile, Otis is watching TV when he sees a story about the Maltese Turtle. Apparently there’s a curse upon the small reptile, stating that anyone who steals it will face “the wrath of the Turtle God!” This news freaks out the lumbering Otis and he commands his smaller sibling to give it back, before the Turtle God gets them – but Sid refuses and a fight breaks out. A man is out fishing on the harbor, and he’s caught Raphael! The fisherman tugs frantically on his line until Raph is freed from the concrete block, pulling him right out of his detective disguise! The force required to free the trapped turtle sends him flying out of the water, high into the air and through the roof of the Doltish hideout. 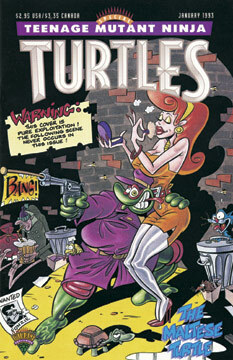 The Turtle crashes right between the battling Doltish Brothers – the sight of a giant Turtle sends Otis and Sid screaming into the night, afraid that Raph is the Turtle God and that the curse has come to pass. Raphael then sees a shadow on the wall of a giant, fearsome snapping turtle and flees in fear of the Turtle God as well! Ma Doltish spots the Maltese Turtle (who had been casting the shadow that upset Raphael) and goes to grab it – but the diminutive reptile has had enough of the adventure and bites the woman’s finger – hurling her back and forth into the floor and knocking her senseless. Free of any captors, the Maltese Turtle disappears into the night. Sid and Otis end up in prison for their crime, Ma Doltish becomes a professional wrestler and the Maltese Turtle returns to its old life of being a performer in Las Vegas.